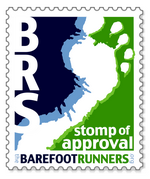 Barefoot Angie Bee: Barefoot Running coaching...why? When I walked into the VIVOBAREFOOT Training Clinic I thought I would "wow" Lee Saxby. I had been successful so far having ran a barefoot marathon and not in "barefoot shoes" but actually naked foot. All of my previous shod race times were bested barefoot. I had been running for two years barefoot and a couple of thousand injury free miles. So when the first thing we did in class was to capture video of ourselves running I thought I was golden. What did I humbly discover? I DID NOT LOOK THE WAY I THOUGHT I LOOKED IN MY MINDS EYE! Not even close even though it "felt" right. Lee said this was the case with everyone. I realized that I had gotten away with running such distances by being lite both in my weight and steps and also a fair amount of luck. I was not running efficiently and tempting the fates with a stress fracture and definitely had some nerve issues popping up from the way I was landing. 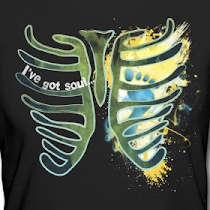 All under the pretense that I knew what my body was doing from the inside out. I saw that I needed to work on all of the things that are touted as barefoot common knowledge. Posture, cadence, and relaxation. This stuff is said over and over and over in the barefoot community and I totally thought I had it down. I discovered that it is still the foundation but not always built level. You need the right tools to build a level foundation. from a photo taken a year or so ago. How is it that I can think I am doing something and then see that in fact I am no where close. I went barefoot all the time. I listened to my feet. I focused and changed yet there was a habit that needed to be broken and my mind was playing tricks on me that I did not realize until I saw myself running on video. I had switched heel striking for forefoot striking but I was still reaching and over-striding and leading with my head instead of my chest. I had a very long lazy trailing leg of which threw all semblance of segmentally aligned posture out the proverbial window. I was humbled and inspired by seeing myself run. I realized that feeling my way through it was not enough. I needed some perspective. I needed some understanding to enhance and realign my intuitive sense. I needed to be able to look at myself from outside myself and hear the input of someone who has a solid understanding of human biomechanics. This perspective was key for me in "getting" the commonly refereed to barefoot nomenclature* and actually connecting mind and body. I got this much needed perspective when I was open to learning to become a coach and being coached myself by Lee Saxby. When one does something the same way for years and years it is difficult to change those habits. Its entirely possible to change but its not always straightforward nor easy. You can learn how to run barefoot after years and years of running in padded cushioned shoes. You can learn how to run well in shoes with barefoot form but it has to start with taking off your shoes but its also more than just that. The key is to blend understanding with intuition. Our minds are complex and different parts of our minds work in different ways. We have our movement mind that rules our movements through subconscious thought and then we have our conscious mind. When we focus consciously on our running form it subconsciously creates stress. You know what I mean. You try something really hard like landing on your forefoot, relaxing those knees, and keeping good posture and your fists ball up, your tongue sticks out, and your neck tenses up. You may have no idea that you are even doing this because you are so focused on your running form. Now after learning to be a coach I have a place to start. I have a plan to follow. I have something solid to offer and I have tested it on myself and been coached by the best. The coaching I offer is the same thing as I was coached. I video tape you running however you run on a regular basis. So if you wear shoes or not and the average pace that you normally run at is what I want to see. Each person I have coached has responded with a resounding and curious NO when I ask if they look the way they thought the looked when running!! The next step is to look at your video frame by frame and assess three things. Posture, rhythm, and relaxation. Next I go through the ideas behind barefoot running of which are based on the different gaits of locomotion we have as humans and how as well as why having good posture, a 180 cadence, and relaxation is key to running. Next we go through the drills to subconsciously change running form without the stress of trying to consciously make your body move in a certain way. As you focus on doing the drills you will see the new movements gracefully transcend into your running form. The more you practice the better you will get! Then we video again and rinse and repeat as necessary. All of this is done barefoot. One can't know how to move if one can't feel what you are doing. To start off, being barefoot as often as possible is ideal. Walk the dog barefoot. Get the mail barefoot. Just be barefoot as much as possible throughout your day. Feel what its like on grass, gravel, sand, roads, sidewalk, brick, cobblestone, dirt trails. Teaching your mind to think of barefoot as enjoyable instead of something that should be avoided and feared is an important first step in your barefoot running journey. * I adore the word nomenclature as it reminds me of The Big Lebowski every time. The dude abides. I was hoping for a photo with all the "Angie doing it right" notes on it. I always thought that photo showed a very solid running posture. Wow, I've still got lots to learn. And I think it looks like you lead with you chest in the photo. I lead with my hips, weird huh? I also do crazy things with my arms/hands when going down hill on trails. I think I'm part bird. Good Luck with barefoot coaching! Video - the great equalizer. But a great tool for runners who want to improve. 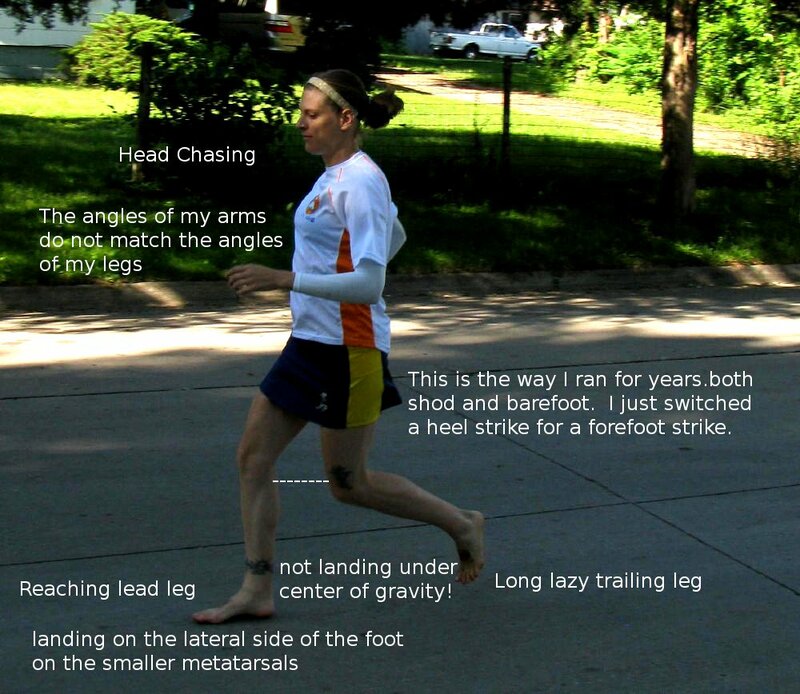 I integrate barefoot running into my routine because of a video of myself running with a horrible heel strike..
Great post! I'm new to barefooting but have been running in reduced shoes for a while (and as a lifelong recreational ballerina, I've always been adamant of the fact that I have great, strong feet). It's helpful to see people who I look to for inspiration and knowledge acknowledging what they need to work on. Good timing - I just got videoed on the dreadmill. I'll be seeing and sharing it soon. The feet can tell you pretty much all you need to know, but there can be a language barrier. A coach can be a good translator. I thought I had it all figured out but after listening to so many RBG podcasts I began to wonder. You definitely hit the nail on the head here.